A Lowcountry Wedding Magazine is the premier publication for weddings along the Georgia & South Carolina coastlines. From the Sea Islands to the Hammock Coast, A Lowcountry Wedding is the authority on Lowcountry weddings. With a wealth of inspiring venues, incredible cuisine and an army of talented wedding vendors, the Lowcountry draws local couples and destination duos from around the globe with ease. Our experts have an eye for creating show-stopping designs that effortlessly combine the Lowcountry style, history, hospitality and scenery we adore. This fresh approach has caught the collective eye of brides and wedding enthusiasts alike from all across the country, and even abroad, who are taking note and admiring the beauty of weddings in Savannah, Hilton Head, Charleston and Myrtle Beach. The end results astound guests and every overjoyed couple is left with magical memories and frame-worthy images that we have the pleasure of sharing with the world. Here, we'll introduce you to the vendors, venues and integral elements of Lowcountry weddings that combine to create the bespoke, magazine-worthy weddings we love to share. A historical jewel on the East Coast, the heart of the Lowcountry lies in its storied past which is now buried deep inside the walls of today's favorite venues. These celebrated buildings have hosted notable figures in American history and now serve as a backdrop for couples to celebrate their love. Undeniably Southern, Lowcountry brides and grooms bring an added flair to their wedding day attire with modern touches, heirloom details and sleek sophisticated silhouettes to create a personalized look uniquely theirs. 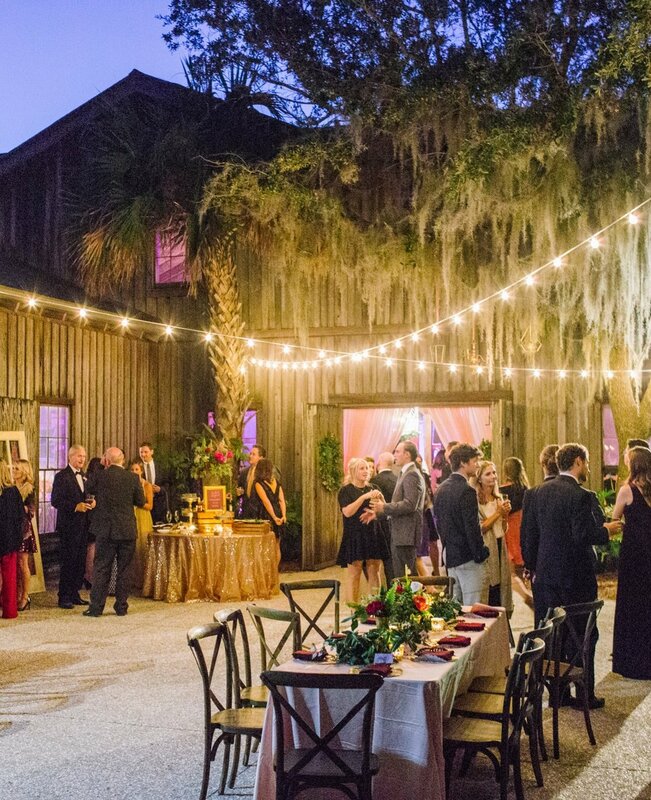 If you're planning a Lowcountry wedding, there is one thing we know for sure - your guests are destined for one heckuva good time! From the first-class hotels and world renowned restaurants to your weekend's wedding festivities, your guest list will surely enjoy our signature Southern hospitality. Unmatched in its beauty, the Lowcountry offers antebellum plantations nestled amongst sleepy oak trees, relaxing oceanfront hotels, contemporary event spaces and elegant ballrooms steeped in the charm of the old South - all ready and willing to serve as the backdrop for your Lowcountry wedding. Image credits (L-R) JoPhoto, TIM WILL, Landon Jacob Productions, Briana Wilbur Photography. Header image by JoPhoto from Bailey & Matt's Boone Hall wedding. Welcome to the coast where Southern design trends begin! Lowcountry vendors skillfully produce upwards of 8,000 weddings each year. From intimate, mid-week elopements to full-scale soirées and everything in between, vendors expertly tailor each couple’s event by creating modern and authentic design elements while weaving in the charm and elegance of the Lowcountry. Click on each city below to find a comprehensive list of trusted, local vendors who are ready to bring your ideas to life. Oh, and don't forget, many vendors are open (and enjoy!) traveling to different cities along the coast. Banner image by Shannon Michele Photography from Ashley & Justin's Hibernian Hall wedding. Search our guide of the top venues along the Georgia & South Carolina coasts. From historic homes to eclectic event spaces, discover your perfect Lowcountry wedding venue. Home to countless, breathtaking venues, the Lowcountry offers a wide-range of properties to fit each couple's unique style and personality. Whether you have plantation dreams or visions of a waterfront affair, you're Lowcountry venue awaits. Images (Clockwise L-R) Pasha Belman Photography, JoPhoto, Ashley Seawell Photography, Mark Williams Studio. Banner image by Billie Jo & Jeremy from Catherine & Zach’s Legare Waring House Wedding.